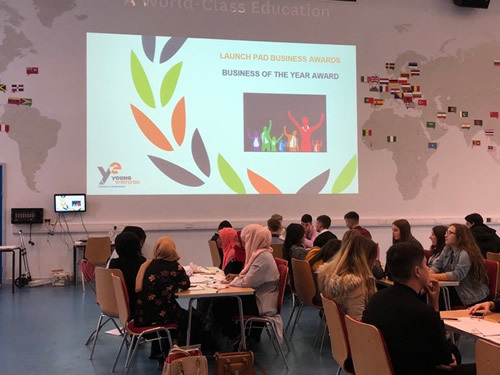 Year 12 students recently spent the day learning about business and enterprise, taking part in a series of workshops run by the company Young Enterprise. Students worked in teams to consider what are the key qualities that make companies thrive, and what skills are required by prospective employers - and how they can ensure they have them! Part of the day included students giving a presentation in small groups to the entire year group – something many students were slightly nervous about doing! However, every student successfully took part, and it was wonderful to see those sometimes lacking confidence in themselves take part in activities far outside their comfort zone; this is what being a Post 16 student is all about! Mrs Fisher then gave students information about the Young Enterprise competition – a chance for students to run their own company, dealing with real stocks and shares, and ultimately aiming to make a real life profit (which they get to keep)! Successful companies can enter a competition against other schools and colleges locally and then nationally; Kingsthorpe College students have won the Northamptonshire area of the competition in the past, so hopefully we can go one step further this year and win the national competition!